Manjhi Faqeer Sindhi Folk Music Singer. He is most popular Sindhi Classical Music, Sindhi Lok Music, Sindhi Sufi Music, Singer. He is great Sindhi singer and he sung in Sindhi, Saraiki and Sindhi Sufi Songs in other languages. Sindhi Singer Manjhi Faqeer is great Sufi Music Artist of Sindh, he created great name in Sindh Music. 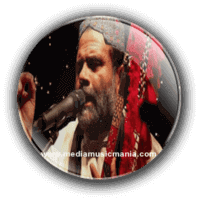 He sung lot of great Sindhi Sufi Songs in village culture and feudal society of Sindh, with its rural base, its "Autaqs" and most important of all as far as the music is concerned, "Shrines" and "Peers and Faqeers". Manjhi Faqeer "Sindhi Topi Figure, Yaktaro and Chapri held aloft, steps onto the stage. Beside him is a smaller, younger man, several other "Saffron Robbed Faqeers" follow open roar of Manjhi Faqeer. He has sung lot of super hit Sindhi Arfana Kalam and he called himself as great Sindhi Sufi Singer. Manjhi Faqeer is very famous and best name in Sindh’s cultural history drew towards a close and he is the greatest surviving Sindhi Music Artist. I have selected below most popular Sindhi Classical Music of Manjhi Faqeer audio songs. Manjhi Faqeer started singing style on "Yaktaro and Chapri" recognize him as a legendary Artist of Sindh and also he is very popular in abroad. Manjhi Faqeer grew up surrounded by the sounds of the Shrines and the Kalam's of the "Sufi poets" and took up the study and practice of Sindhi Sufi Music, Sindhi Folk Music, Classical Music. Manjhi Faqeer is very popular in all over Sindh, he sung in local TV Channels, such as KTN TV, Kashish TV, Sindh TV, and also local "Mehfils" in all over Sindh. He sung great songs and love with "Hazrat Sachal Sarmast R.A", "Hazrat Shah Abdul Latif Bhitai R.A", "Hazrat Bedal Faqeer R.A", "Hazrat Manthar Faqeer R.A" and other popular Sindhi poets. His most popular song was "Haq Maujood Sada Maujood.